Are you motivated to strengthen the Union? We are looking for people like you to build DCTA membership and keep teachers informed about Bargaining! 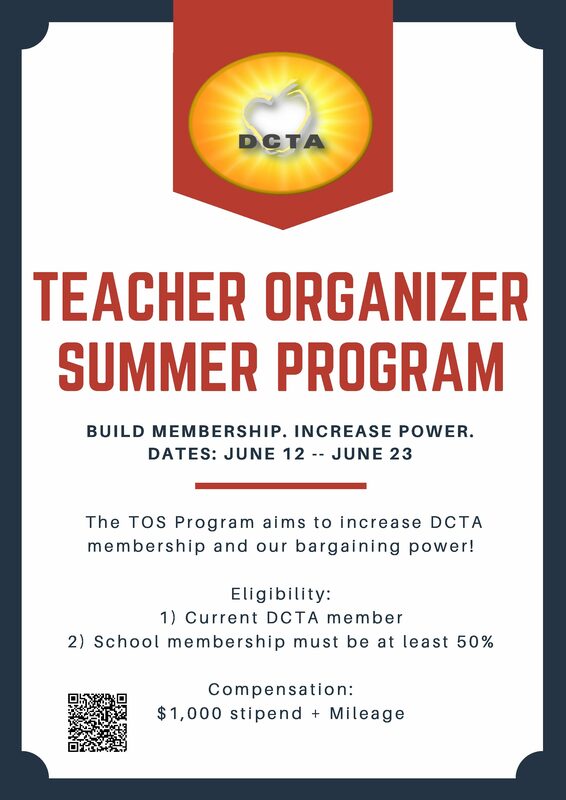 Apply to be a part of DCTA’s brand new Teacher Organizer Summer Program. The TOS Program will consist of 9 Teacher Organizers conducting house visits to non-members who are returning to DPS for the 2018-2019 school year, with the goal of increasing Association Membership and bargaining activism. Earn a $1,000 stipend plus mileage for a training and eight workdays, Monday—Thursday, 11:00am-6:30pm, during June 12-June 23. Applications are due by May 7. Apply here.